Exactly how many degrees of frost fig trees can tolerate is hard to say. It depends on a number of circumstances. If the conditions are optimal they can withstand up to -23 degrees Celsius with out any problem. What we consider as optimum conditions mean that the tree is placed on a sheltered place against a wall, well-drained soil and poor growing conditions. By meager growth enhances a stocky, compact plant with modest growth and well-woody branches. 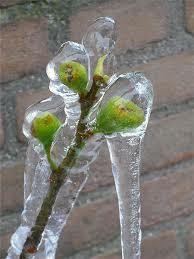 Overall figs survive excellent in the Dutch climate. Figs do not really need a hot summer, but a mild winter.